Communities of litter fungi are often considered in terms of successional colonisation patterns, and the established picture is that ascomycetes dominate at early stages of litter decomposition, whereas basidiomycetes dominate later (Frankland, 1998). When plant litter arrives at the forest floor, needles and leaves are already colonised by fungi. Phyllosphere ascomycetes colonise living plant tissues as biotrophic parasites or sometimes necrotrophic pathogens, but a significant fraction of these fungi persist in dead litter, and some are more active as litter saprotrophs than as biotrophic endophytes (Osono, 2006). 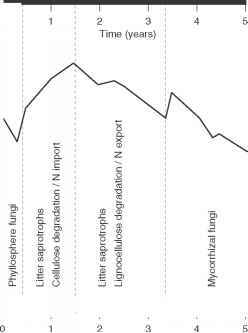 During the first year of pine needle decomposition, primarily soluble sugars and less recalcitrant substrates are lost from the litter (Figure 1; Berg et al., 1982), implying that fungi without explicit cellulolytic capacity may also be active in the litter. In Pinus sylvestris needles at early decomposition stages, Lophodermium pinastri (Rhytis-mataceae) dominated together with Sydowia polyspora (Dothioraceae), a Lachnoid species (Hyaloscyphaceae) and another helotialean taxon. These species declined rapidly in abundance during the initial year on the forest floor. Scleroconidioma sphagnicola (Dothioraceae) also occurred abundantly during the first year but was able to persist for up to 2 years, confirming the suggestion by Koukol et al. (2006) that this species has a high capacity to endure competition. Figure 1 Data from a litterbag experiment (berg et al., 1982) in which scots pine needles were incubated on the forest floor for 5 years. Samples were retrieved at regular intervals and analysed for chemical composition. The plots show (a) change in major chemical components of the litter, and (b) absolute amounts of nitrogen in the litter. In both plots, the chemical content is relative to the initial litter content. 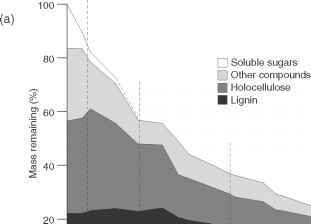 In (a), 'Lignin' refers to acid insoluble material (klason lignin), 'holocellulose' includes hemicellulose as well as chitin (fungal production of chitin may explain the initial increase in this fraction), 'soluble sugars' are mainly fructose, glucose and pinitol, and 'other compounds' are mainly lipids and terpenes. Data on 'soluble sugars' were available for the first year of decomposition only. 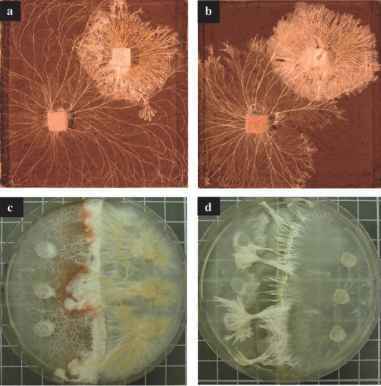 In addition to these ascomycetes, basidiomycetes within the genera Athelia and Sistotrema were detected after a few months but were absent after 1 year, indicating a ruderal strategy (Cooke and Rayner, 1984). Athelia and Sistotrema species form delicate resupinate sporocarps consisting of basidia on a thin sub-iculum directly on the substratum (Larsson et al., 2004) and are therefore likely to be overlooked in sporocarp inventories. The simple sporocarps, producing large amounts of spores with a relatively small investment of biomass, could reflect the ruderal strategy. Records of DNA from Athelia species in decaying litter of Pinus taeda as well as in mixed deciduous litter in eastern USA (O'Brien et al., 2005), and from Sistotrema species in pine and spruce litter from three different Swedish locations, suggest that these fungi are common and widely spread members of saprotrophic litter communities. Marasmius androsaceus, known to form sporocarps on relatively fresh litter (Frankland, 1984), was also detected in needles a few months after abscission.